This inspiring story of a relationship between father and son gives flight to the imagination. The boy believes that with his dad he can be and do anything. He can build sandcastles and be a pirate. He can build bridges, fly like an eagle, travel to the moon, and build a racing car. With his dad everything is possible. He is fearless and his possibilities are limitless. This excellent book shows how children can be empowered by adults to become what they want to be. It’s about self-esteem and confidence, and that is mainly generated by the people they love the most in life. It’s about being loved and supported no matter how silly things seem. Life is there to be tasted. I loved this book in its entirety because of the positive messages it contains. Their morphing depends on the reader’s interpretation of the underlying themes discovered in the text. The illustrations in watercolour and black pencil are genuinely endearing while very casual, as are the characters. 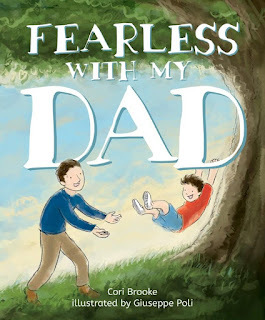 The book is full of joy, with a magical connection existing between the boy and his dad. There is a visible assurance about what can be done or accomplished throughout the story. The confidence of the child is a tangible thing. This book for the 3-6 age groups (but also for adults) has so much potential for use as a teaching tool. It should be found in schools, libraries, and homes, for although it is a boy and his dad, the message is clear. All we need is encouragement and someone to believe that we can, so we can also believe it ourselves.